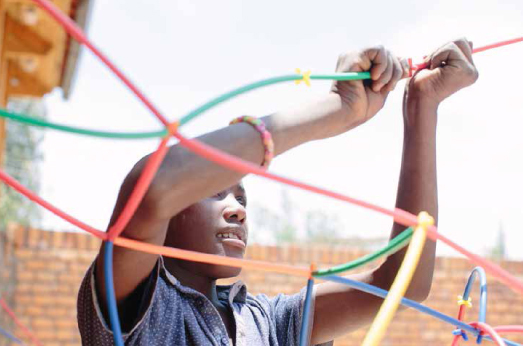 We recently received a heartwarming report about the wonderful creations made with our Straws and Connectors at St. Jerome’s Children’s Home in Nakuru, Kenya! Rebecca Milling shares her experiences at the children’s home below! “We were staying in Nakuru, Kenya’s 4th largest city, north west of Nairobi. Most days, we took the very dusty and bumpy 30 to 60 minute bus journey up to St Jeromes Children’s Home situated near to the village Muronyo. My husband, the photographer Peter Dibdin, had been invited by a charity for Humanitarian Architecture, Orkidstudio, to document the building of a house using earth bags. 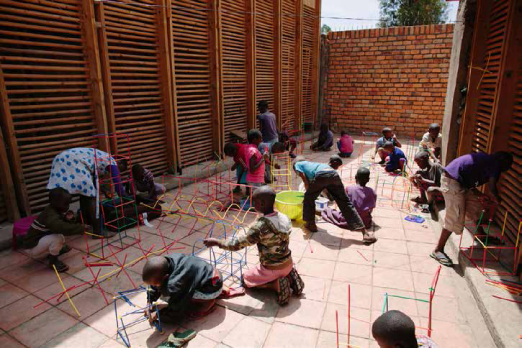 In August 2014, Orkidstudio had designed and built the St Jerome’s Children’s Home building, so Peter also documented this building in use. I volunteered myself and our five year-old daughter to go with them to do creative workshops with the children living at St Jeromes. Educational Advantage kindly donated six kits of Roylco Straws and Connectors for us to take with us. Arriving there was wonderful. We were embraced with a warm welcome and were always made to feel at ease in the happy and relaxed atmosphere where Grace, Phyllis and Gladys live with 31 children, who range in age from 4 to 17 years old. On the first Saturday, when the children were off school, we arrived with the Roylco straws and connectors. I had plans to split them into teams and build structures across the courtyard. However, as soon as the suitcase was opened and I showed the children the very simple act of putting a connector into a straw to connect another straw, I was redundant! 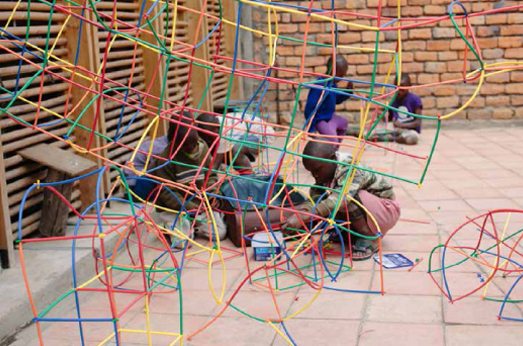 The children swarmed round the straws and immediately started building – in pairs, individually and in groups. There was no stopping them they were so excited at the prospect of designing amazing structures. One girl only used yellow; one boy designed a vehicle to push a football; another created a magnificent piece of engineering that could have been an insect or an aeroplane. I stood back and watched as the air was filled with excitement and enthusiasm for their creations. I had brought the straws and connectors in a suitcase without any packaging or images of what could be achieved. This was partly to save space in my luggage but also because I was interested to see what ideas developed from the children’s imaginations and not from what they copied or were inspired by in a picture. It was extraordinary to watch the children’s immediate reaction to the straws and connectors and their strong instinctive desire to build with them. I later managed to split the children into two teams and we built across the courtyard which was great fun and they had all worked out their own methods of building by then. 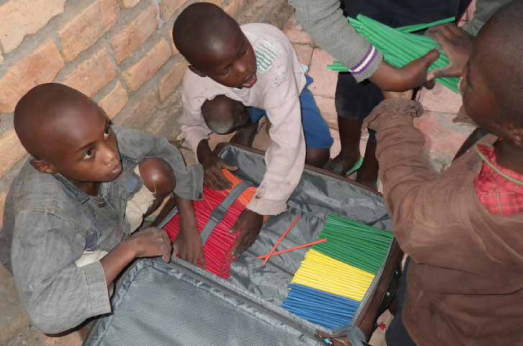 The children also loved colour coding all the straws when they neatly packed them away into different coloured bundles. I did various other art workshops, but there would always be a few children nagging and asking when we could get the straws out again! We often got them out after school and one day, I showed them the diagram of a shelter and they split into two groups. It was raining so we were crammed inside and when they had created a structure as a shelter, I took out the pieces of blue organza material, which had been included in two of the kits. I cannot describe the screeches of delight and excitement that this ignited – to have a tent! Thank you, Rebecca and Peter for sharing with us your experiences and beautiful photographs! 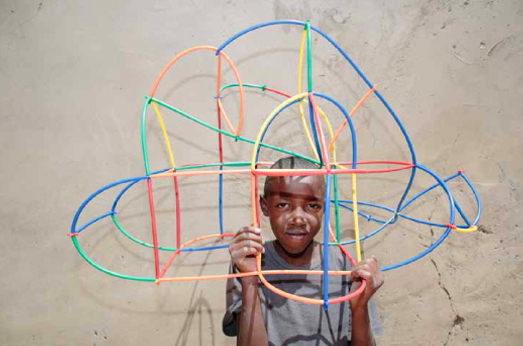 This entry was posted in Art, Crafts and tagged art workshops, art workshops kids, building projects for kids, building structures, charity, donation, educational advantage, engineering kids, nakuru kenya, st jeromes childrens home, straws and connectors, volunteer work by roylcoblog. Bookmark the permalink. We love to hear such positive feedback like this!! Thank you for sharing!